Its summer and its the time of your where I want to feel like being on vacation instead of spending time at the office. Vacation makes me think of "South of France", "Le Grand Bleu" and palm trees. Afterwards we usually sit down for some coffee and cake at the self-serve restaurant at "Main Nizza" which offers pretzel and french fries. Upstairs is a full service restaurant I wanto to check out sometime soon. During weekdays, it serves as a cafeteria for private bank "Metzler's" employees. When I first started exploring the city I wanted to find something extraordinary, explore the hidden or forgotten treasures of Frankfurt's beauty. And that green park "Nizza embankment (Nizza Ufer) named after the French city really mesmerzied me from the very beginning. The fabulous thing about that German name is its meaning: The river can refer to "mine" or "my" Nice. By clicking here you will find some extra information about its origins, written in German. Because of its location facing south exotic plants in one of the largest gardens north of the Alps grow there. 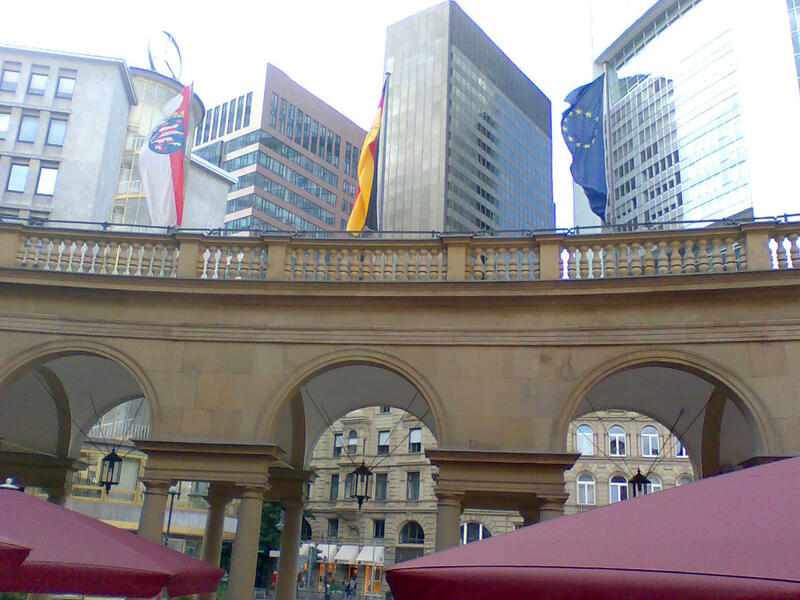 Its located extending the Wall right upto the river between the Römer (city hall) and Central Station heading West. And if you still have got some time left, cross the river and enjoy yourselves at one of the many museums. For the "Nice" feeling on a weekend. Ach ja, in Nizza ist es schön! Ich finde es sehr schade, dass es dort heutzutage kein Strandbad am Main mehr gibt. Die alten Bilder die auf den Infotafeln am Nizza angebracht sind, sehen einfach so toll aus. Ich fände es wirklich toll wenn es so etwas wieder gäbe.